Le FETTY in The Americas was in 1689 Quebec. The Fetty surname is found in history from the Alps of Austria, France, Germany and Northward. 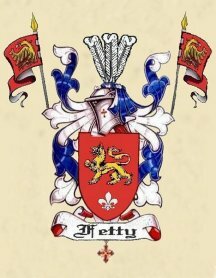 FETTY, FETTY HISTORY, FETTY COAT OF ARMS, FETTY BLAZON OF ARMS, FETTY FRANCE, FETTY GUYENNE.